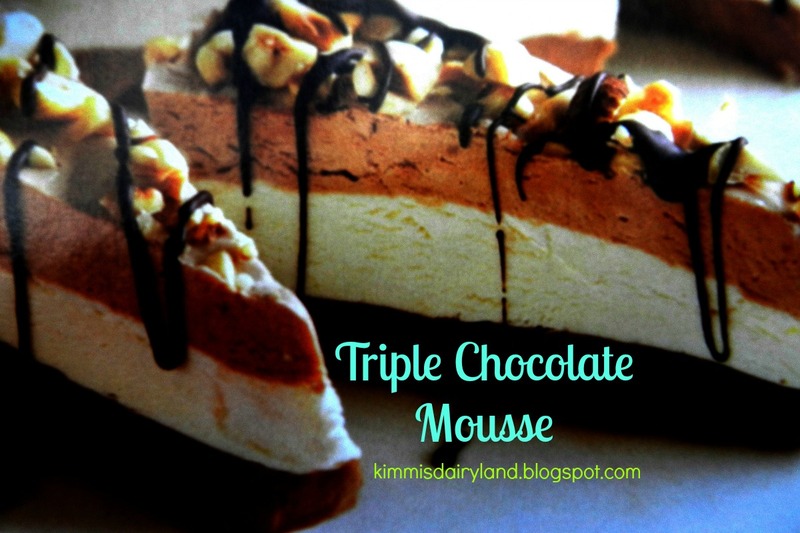 When I filled out my application to run for Dairy Princess in March 2005, I wish I'd known about this Chocolate Mousse recipe since one of the last questions asked for our favorite dairy recipe. You may have seen a lot more talk about dairy and dairy farming this month. It's June Dairy Month and that's a pretty special time for those of us in the dairy industry. As if we ever need a reminder to be proud of our industry and promote it, this month tends to re-energize a lot of people. I personally love seeing dairy stuff every where I look. It's awesome!! I don't have quite the sweet tooth that I did as a teenager, but I do love a good chocolate dessert on occasion. This is one of them. I've made it with and without hazelnuts. You can substitute any nut (I like walnuts) if you don't like hazelnuts. Line an 8x4x2 inch or 9x5x3-inch loaf pan with heavy foil, extending foil over pan; set aside. In a mixing bowl, beat 1/3 of the cream cheese with an electric mixer on medium for 30 seconds. Beat in the 2 ounces dark chocolate. Fold in 1/3 of the dessert topping. Spread mixture evenly in prepared pan; cover. Freeze about 30 minutes or until firm. Meanwhile, in a clean medium mixing bowl half of the remaining cream cheese with electric mixer on medium for 30 seconds. Beat in white chocolate. Fold in half of the remaining dessert topping. Spread evenly over frozen dark chocolate layer in pan. Cover and freeze about 30 minutes or until firm. Meanwhile, place remaining cream cheese in a clean mixing bowl. Beat with electric mixer on medium for 30 seconds. Beat in milk chocolate until smooth. Fold in remaining dessert topping. Spread over the frozen milk chocolate until smooth. Fold in remaining dessert topping. Spread over the frozen white chocolate layer. Sprinkle with hazelnuts. Cover and freeze for 2 to 24 hours. To serve, using the edges of the foil, lift mousse from pan. Let stand at room temperature for 20 minutes to soften slightly. Cut loaf crosswise into 10 wedges. 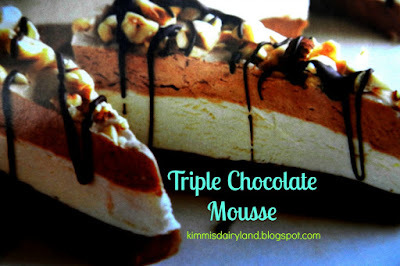 Melt together dark chocolate and shortening; drizzle over mouse slices.